SIGN UP TO SAVE NOW! Receive member only, exclusive offers and new product information. Pediatric wheelchairs are designed for a child’s maximum comfort. These frames tilt adjustable and recline. Many have infinite adjustability to help with positioning during meals and to aid digestion. Because you can recline the frame there is no pressure hot-spots and maximum comfort for the user. Many chairs come with extra padding for the seat, body, legs and side-bolsters for the head and neck. There are a variety of models available: self-propelled powered bases, and manual. Depending on the level of care and independence a child needs, you can be sure we have the chair for you. There's no better place to order your Durable Medical Equipment. 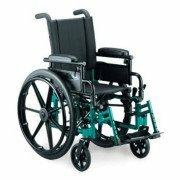 Whether you're looking for Wheelchairs, Scooters, Power Chairs, Hospital Beds, Walkers, Rollators, Patient Lifts, Respiratory Equipment, Bath Safety or Incontinence needs, we have the highest quality and the most experienced customer service. 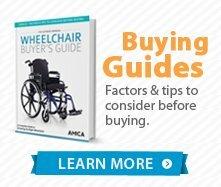 Amica Medical Supply staff is able to help you make the best possible choices when it is time to purchase your new medical equipment. We carry a huge selection of Durable Medical equipment to fit everyone’s needs from every top manufacturer including Invacare, Medline, Drive Medical, Golden Technologies, Hoyer, Joerns and many more. Carrying the largest variety of manufacturers allows you to the most choices to try the newest products on the market. Our customer service team is standing by to help you with any questions. Whether you're ordering a product for a loved one, or buying for a facility, you can call our expert staff with your questions. Our team has answers! Just call 1-888-939-0774, or place your order online. We will help you find and deliver the exact products for your needs. Free shipping on products over $50! * Shipping times displayed on the website should be used a general guideline only. While we do everything we can to get the items shipped as quickly as possible, sometimes items get delayed due to circumstances beyond our control such as weather, port strikes, manufacturer delays, etc. We try to notify you of any such delays immediately as they happen, if at any time you have any questions about your shipment you are always welcome to reach out to us either by phone or email. Sometimes you may need to have durable medical equipment to help you move around your home, handle a special condition, or to simply manage your life. In these cases, you need to know that help is available to assist you with short and long term conditions. Whether you're recovering from surgery or an illness, or you just need help with everyday tasks as you age, durable medical equipment can allow you to get on with your life. Medicare DME Coverage Guidelines and Medicare Services Resources. We support many non-profit organizations, here are a few most trusted partners: ALS Association, National MS Society, Muscular Dystrophy Association. © 2018 Amica Medical Group. All Rights Reserved.